Welcome back as we bring you our first update from sunny San Jose in California, and, unlike large parts of the US, there isn’t any snow to be found here. Today is the first day of the conference and we actually were off to an early start as we had an appointment with AMD. That might sound awkward as we’re at an Intel event, but like the last IDF and the one before that, AMD was also present and was welcoming journalists to their hotel suites for a demo of their upcoming products. Naturally we were wondering about what they had on display as they basically did not give us any information about the Athlon-64 during our previous visit to their Fab 30 manufacturing facility In Dresden so we accepted their invitation. Fig 1. A look inside an AMD Athlon-64 system featuring the AMD reference design Solo motherboard and a 2GHz Athlon-64 CPU. This time we were hoping to get some answers to our questions about the Athlon-64’s performance, pricing, and availability. Unfortunately there seemed to be a problem with showing us any actual benchmarks as the technician that was supposed to prepare the machines had fallen ill, naturally we were disappointed to hear that, but never the less looked at some of the systems they had on display. We asked AMD to get back to us later today or over the course of the week if they had the systems properly setup and the benchmarks running so we can get an idea of the Athlon-64’ performance, we hope to bring you more information about that later this week. Fig 2. 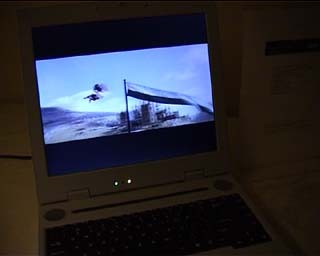 A video of the Athlon-64 notebook playing a DVD and the AMD spokesperson talking about the features of the notebook. Requires Windows Media Player. What did impress us though was their mobile Athlon-64 prototype they had on display, as although this is just a concept and something that probably won’t be available until September it still serves as a good example of the broad range of applications the Athlon-64 core is suited for. Unfortunately no information was available on what the battery life and performance was like, so we don’t know how it measures up to current Pentium 4-M and upcoming Pentium-M, or rather Centrino, notebooks. The video has some further details on the actual configuration and features of the notebook as well as how AMD will be going forward with the launch of the Athlon-64 architecture. Fig 3. 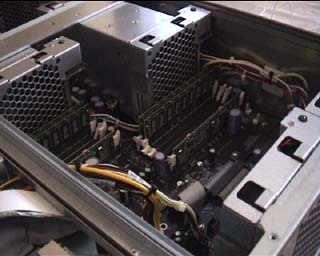 A video of a four processor Opteron server prototype, running a 64-bits version of SuSe Linux. Requires Windows Media Player. Next up was a showcase of their four processor Opteron server, the server version of the Athlon-64, this again was a demonstration at best as no benchmark software was installed so we had no idea about the performance of the server. It was outfitted with PC2100 DDR dual channel memory and featured dual Gigabit Ethernet controllers and up to five U320 SCSI harddisks. The CPUs were fitted with a huge heatsink that covered the CPUs in pairs and used two fans in a tunneling configuration; one fan sucking in air from the front, whereas the other would be drawing it out from the back, as a result creating maximum airflow over the CPUs. That wraps up our first update of today, we’re off to the first IDF keynote which will be held by Pat Gelsinger and Craig R. Barret and starts in about half an hour. They’ll talk about the convergence of technology and the new fields where Intel is focusing on, which includes optical electronics. And naturally they’ll go into greater detail about what will be featuring in the many keynotes, tracks and seminars that’ll be given this week. Do check back later today or early tomorrow morning for an update on the 1st keynote and a report from the showcase of the various manufacturers on the showfloor. Discuss This Article (5 Comments) - If you have any questions, comments or suggestions about the article and/or its contents please leave your comments here and we'll do our best to address any concerns.